Time to gather your family and friends for Yum Cha time at Canton Paradise! Enjoy 50% off all dim sum, congee and noodles (excludes noodles with roast items) on weekdays from 3pm to 5pm! 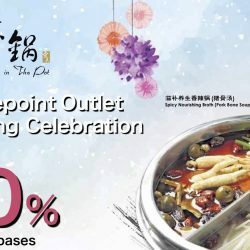 Celebrate the opening of the 2nd outlet of Beauty in The Pot at Centrepoint with up to 50% off 6 available soup bases! The more the merrier, bring more ladies and dive into a feast of fresh hotpot ingredients and homemade specialities over an array of nourishing soup bases of your choice. Exclusively for Maybank Credit/Debit Cardmembers and PGR members from now till 20 January 2017! In addition, the outlet opens till 6am daily, and if you dine after 10.30pm, you get 20% off food ingredients! Weekdays from 3pm to 5pm Paradise Hotpot: 50% off ALL Ingredients for a Limited Time! What’s better than enjoying a happy tea time with your friends or family at an incredible 50% off ALL ingredients at Paradise Group's latest brand concept – Paradise Hotpot! Available exclusively at Compass One mall on weekdays from 3 - 5 pm. Be spoilt for choice over 14 different soup base selections, which includes Chicken with Wild Mushrooms, Spicy Szechuan, Korean Kimchi, Tomato with Sweet Corn and more! Look forward to delight and indugle in your individual steaming pot of soup with a wide array of fresh and quality ingredients today! Serving an array of imported live seafood and popular local delights, Seafood Paradise marks the beginning of Paradise Group, and has been well-loved since the days at Defu Lane. Today they celebrate the opening of this home-grown brand at Marina Bay Sands! 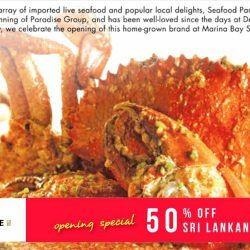 Head there to indulge in Sri Lankan crabs now and get 50% off from now till 9 October 2016 exclusively for OCBC Credit/Debit Cardmembers and PGR members! 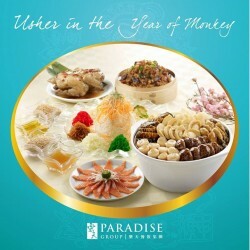 Usher in the Year of Monkey with their Lunar New Year pre-sale Abundance Set from Paradise Group of Restaurants! 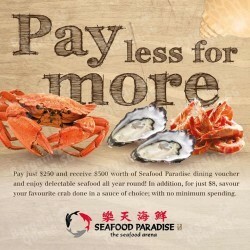 What's more, receive a can of 10 piece abalone and $30 dining voucher for every regular Abundance set ordered. Pre-sale of Abundance Set is valid from 8 Dec 2015 to 10 Jan 2016, limited sets available. Other terms and conditions apply. Visit here for more details. 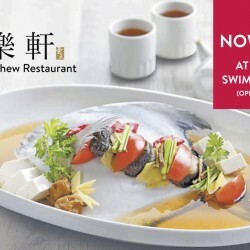 If you love Teochew cuisine, dun miss the newly opened Paradise Teochew Restaurant under the Paradise Group at Chinese Swimming Club! Exclusively for OCBC, Chinese Swimming Club and Paradise Gourmet Rewards Cardmembers, get 30% off food bill on weekdays and 20% off food bill on weekends! With over a hundred dishes of Teochew style signatures coupled with an array of dim sum offerings for lunch, diners will certainly be spoilt for choice at Paradise Teochew Restaurant! 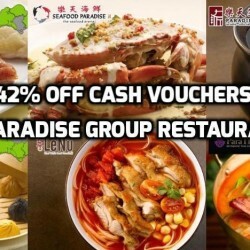 To celebrate Paradise Group's 7th anniversary, they are having 42% off cash vouchers at Groupon Singapore! Choose from any of the award-winning group of restaurants: Canton Dynasty, Paradise Inn, Paradise Dynasty or Seafood Paradise to enjoy authentic Cantonese cuisine! You can also go for Thai food at ParaThai or Taiwanese beef noodles at LeNu! Limited time only, hurry while stocks last! 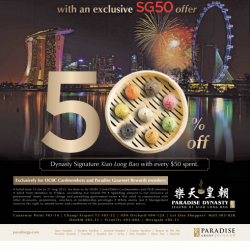 Enjoy and celebrate the nation’s 50th birthday with an exclusive SG5o offers and get up to 50% Off Signature Xiao Long Bao with every $50 spent exlusively for OCBC cardmember and paradise gourment rewads members at Paradise Dynasty hurry grab yours Today! 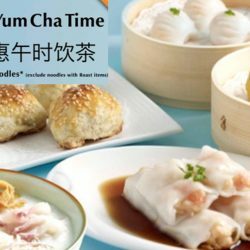 Enjoy your self for a place to take a break Simply head down to selected Paradise Dynasty restaurants and enjoy the unbelievable tea-time special set at $6.80, inclusive of a basket of 6pcs original xiao long bao, a dessert and beverage of your choice. 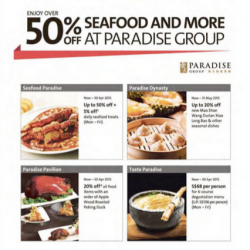 Paradise Group with OCBC Cards offers you 50% off Seafood and more. 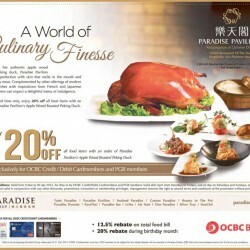 Get your hands 20% OFF All Food Items with Order of Apple Wood Roasted Peking Duck at Paradise Pavilion, until 30 April 2015. Don't Miss Out! Calling all durian lovers! 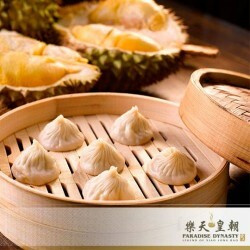 Go on a gastronomical adventure with their limited edition Durian Xiao Long Bao. 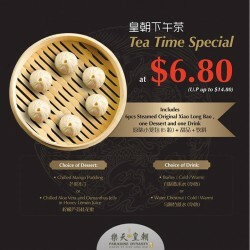 From now till 31st May, enjoy their Durian Xiao Long Bao at a special price of $8.80 (U.P. $10.80). 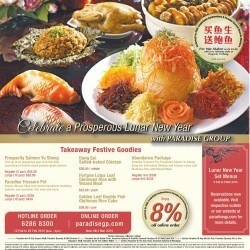 Celebrate a Prosperous Lunar New Year with Paradise Group. Paradise Group offers takeaway festive goodies special. Enjoy 8% off all online orders + additional 10% off takeaway order of Paradise Treasure Pot this 23 & 24 February 2015. Stretch your dollar and get more for less! For a limited time only, Pay just $250 and receive $300 worth of Seafood Paradise dining voucher and enjoy delectable seafood all year round! In addition, for just $8, savour your favourite crab done in a sauce of choice; with no minimum spending. 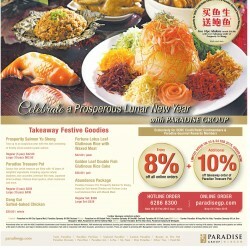 Celebrate a Prosperous Lunar New Year with Paradise Group. Get your hands Free Abalone with every takeaway order of Prosperity Yu Sheng.